By Matt KettmannWhen the first wine grapes were planted in California by Spanish missionaries in the late 1700s, the Chumash people's economic empire extended from the Malibu shores through Santa Barbara to the Paso Robles plains. But by the time the modern wine industry emerged on the Central Coast a couple centuries later, the Chumash were struggling, much like many Native American tribes. The few dozen who managed to achieve federal recognition as the Santa Ynez Band of Mission Indians were left with a little slice of land, where most residents lived below the poverty line. Fast forward to today, and the Chumash are once again prospering, thanks to a successful casino and resort they built on their Santa Ynez Valley reservation in 2004. Six years later, with hopes of expanding their reservation, the 154-member tribe bought a nearby 1,400-acre property for a reported $40 million from the late actor-turned-vintner Fess Parker. The land came with 256 acres of vines, the Camp Four Vineyard, planted with 19 different grape varieties. 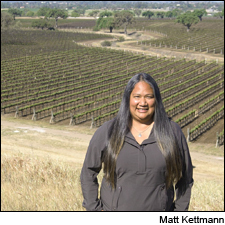 While honoring existing contracts for the fruit (one-third of it goes to the Parker family's brands, while most of the rest is sold to about 70 small producers from all around the state), the Chumash started making their own wine, and released their first vintages of Kitá Wines last month.And:The first Native American group in modern times to grow wine grapes was the Osooyos Indian Band of the southern Okanagan Valley in British Columbia. First planted in 1968 and then grafted over to French clones in the 1990s, the band’s 1,200 acres of vines mostly supply other producers, but they retain about 60 acres to make 18,000 cases a year under the brand Nk’Mip Cellars, which started in 2001. In Arizona, members of the Yavapai-Apache Nation started Fire Mountain Wines in 2010 and, in California’s Sonoma County, two tribes of Pomo heritage both purchased vineyards in 2012: the 270-member Lytton Band, which own the San Pablo Casino in the Bay Area, spent $13.3 million to buy a 110-acre vineyard of Cabernet, Merlot and Chardonnay on 269 acres of land from Jordan Winery in the Alexander Valley, while the 1,000-member Dry Creek Band spent $24 million on 310 acres of land surrounding their River Rock Casino in Geyserville, including 130 acres of Chardonnay, Sauvignon Blanc, Gewürztraminer and Cabernet Sauvignon vines near the Russian River. More inland, about an hour northwest of Sacramento in the Capay Valley, the Yocha Dehe Wintun Nation also got into vineyards as a way to diversify their business beyond their Cache Creek Casino. In 2012, the tribe became the first in California to release their wines, including a Viognier, Syrah rosé and two red blends under the Seka Hills label.Comment: For more on the subject, see Osoyoos Band's Nk'Mip Winery and Yoche Dene Wine and Olive Oil.